Apple’s products are often seen as being priced “at a premium”. This is mostly a matter of perception, but in certain categories Apple’s products are priced above the industry average (though probably still affordable to sufficiently large populations). As a result, when competitors launch lower-priced products there is a tendency to expect Apple to react and reduce its prices to compete. This expectation was evident when AT&T had an exclusive on the iPhone. The assumption among many (expressed in comments here as well as elsewhere) was that a switch to multi-carrier distribution would result in a price reduction and consequently a reduction in margins. It was evident in the iPod and the Mac businesses over the years as prices for competing products collapsed. It is also evident with respect to the iPad where expectations are that the Kindle will cause a reduction in the iPad price (and presumably in the margin). Over the time span shown (six years) the Mac and iPod saw modest price erosion as would be expected from declines in component costs but there is little evidence that Apple altered fundamental price points (note that these values represent pricing to the channel not to consumers who pay for retail mark-up or discounting/subsidy/taxation). Similarly, both the iPhone and iPad have held prices very consistently. There is some seasonality as products are launched and there were a few quarters where the original iPhone was priced differently, with operator service revenue sharing lowering the up-front price. But there is a consistency to these products that speaks of a strategy that avoids price-based competition. In the latest quarter Apple launched a few new price points for the iPhone. With the 3GS and the iPhone 4 and 4S available, Apple had the closest it ever came to a phone portfolio. There was some anticipation that the 3GS price point ($375) would impact the average selling price. However Tim Cook stated that the 4S was the most popular product. Furthermore, the 4S introduced a higher capacity (64GB) which offered a new, higher price point. As a result, the ASP for the iPhone actually increased to about $660 in Q4. 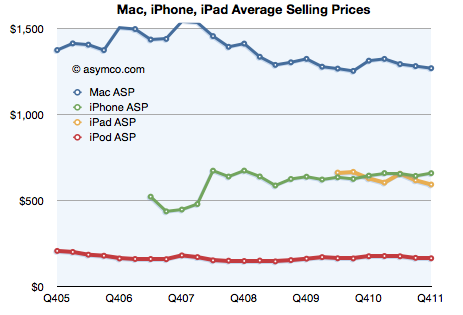 During the launch quarter the iPhone ASP does tend to be higher but history shows that the variance is small. Gifting seasons also affect pricing where the mix shifts to lower priced variants as seen with the iPad and iPod, but again, these are not great changes and entirely due to mix shift. There is no discounting. The evidence I see is that Apple does not change pricing but rather stakes out a specific price point as resonating with consumers given their positioning. They then doggedly stick to it. Competitors tend to exploit open price points or try to position with specs on the same spots Apple occupies. That’s not a game I observe being played by Apple.